The City of Houston acquired Elizabeth Baldwin Park in 1905. It consists of 4.88 acres on Elgin Street, between Crawford and Chenevert Streets, in a proud old neighborhood facing revitalization in the Twenty-first Century in the form of renovated houses and newly built townhouses and businesses. New trees have been planted to supplement the hundred-year-old specimens dating from the park's birth, and an irrigation system has been put into place. A crushed granite jogging trail has been installed, as have new picnic tables, chess tables, and sidewalks. The Vietnamese Heritage Plaza greets visitors in a variety of languages and honors the Vietnamese community that flourishes in Midtown. The old park has been reborn as a monument to civic pride and the efforts of the area's Twenty-first Century citizens. A serene atmosphere surrounds the 1912 stone fountain. Standing in Elizabeth Baldwin Park, one would never know that its history involves a wife's double-dealing and the contesting and forging of wills, her husband's murder, and the founding of one of America's premiere institutions of higher learning. It is Houston history at its most fascinating. 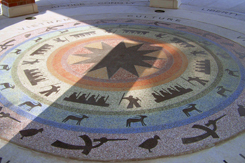 Houston was founded in 1836 by Augustus C. Allen and John K. Allen. It is likely that family money from Augustus's wife, Charlotte Baldwin Allen, contributed to the establishment of the city, and it is certain that she owned large blocks of land here. In 1854, she donated the property known as Market Square to the city in the absence of her husband, who, having seen the city take off, then took off, himself, to act as U.S. Consul in Mexico, never to return. He died in Washington, D.C., in 1864. Horace Baldwin, Charlotte Allen's brother, served as mayor in 1844. His daughters married well, Charlotte Baldwin to Frederick Rice and Elizabeth Baldwin to James Brown, both prosperous businessmen. After Brown died, Elizabeth married Frederick's brother, William Marsh Rice, himself a widower and one of the richest men in Texas. The four Rices fled Houston's tropical diseases, moving to a social world more to the tastes of millionaires, New York City. They returned often for business purposes, but in 1896 they came for another reason: they hoped the warmth of Houston would rejuvenate Elizabeth's failing health. The return to Texas resulted not in better health but in a secret will. Elizabeth claimed in it that she and William were residents of Texas, a community property state, which gave her control of half of his vast wealth, which, if distributed according to her will, would have ruined his dream of using it to establish a great university. She died in July 1896, and William was shocked when her executor, Orren Holt, filed the secret will for probate. He immediately contested it through his Houston attorney, James A. Baker, claiming that the Rices lived in New York. Holt hired a New York attorney named Albert Patrick to investigate that claim, who interviewed Rice's valet, Charles Jones. In the interest of bringing the suit to a quick close, Patrick decided the best idea was to murder Rice before he could succeed in overturning Elizabeth's Texas will. He convinced Jones to dose him over time with small amounts of mercury. Soon, that wasn't good enough. Patrick wrote a new will, forging Rice's signature to it, which would leave most of the fortune to him. He sat back and waited for the mercury to do him in. It might have worked if not for the 1900 Storm, which caused considerable damage to some of Rice's Texas companies. He sent large sums to his offices here to cover repairs, sending Patrick into a panic that the fortune would be lost before he could reap the rewards of his crimes. He compelled Jones to finish the job, and during the night of September 23, 1900, William Marsh Rice was smothered with chloroform. Impatience pushed Patrick on, and he tried to cash a forged check. The bank balked, investigated, and discovered that Rice was dead. James A. Baker pushed for an autopsy, and the murder was uncovered. Charles Jones testified under a promise of immunity, and Patrick was convicted and sentenced to death, a sentence later overturned on grounds relating to doubts about evidence. Orren Holt settled the lawsuit over Elizabeth's secret will for $200,000, and Rice's estate was cleared to establish what is now known as Rice University. Holt, innocent of his associate's crimes, went on to serve as Houston mayor from 1902-1904, and the Rices' nephew Horace Baldwin Rice did so from 1896-1898 and from 1905-1913. James A. Baker continued to be a force in Houston through the law firm founded by his father, Baker & Botts, still one of the most prestigious firms in the world, still based in Houston. His grandson, James A. Baker III, reaffirmed the family connection to Rice University by founding the James A. Baker III Institute of Public Policy there in 1993. Orren Holt, acting as executor of her finally-probated will, used $9,250 of it to purchase parkland for Houston on May 9, 1905, as directed in that document. The City of Houston finalized the park transaction by buying it from her estate for the sum of $10.00. 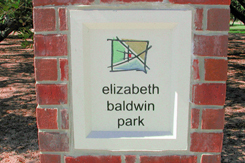 The result is the Midtown gem known by her name, Elizabeth Baldwin Park. And there in the park is the 1912 fountain that takes it all back to the beginning, being named in honor of Elizabeth Baldwin Brown Rice's aunt, the founding matriarch of Houston, Charlotte Allen. Market Square, the downtown block bounded by Preston, Milam, Travis, and Congress, was donated to the city by Augustus and Charlotte Allen, Elizabeth Baldwin's aunt and uncle. Originally home to the Market House, as Houston's city hall was known in those days, it is now a park in the middle of the bustling County Courthouse district. 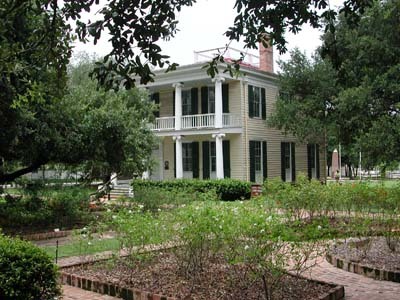 The Nichols-Rice-Cherry House is a Greek Revival mansion that dates from 1859. William Marsh Rice bought it from his business partner, Ebenezer Nichols, for his first wife, Margaret. When she died in 1863, he abandoned the house and moved to Monterrey, Mexico, for the duration of the Civil War. It is believed that he never lived in it again. 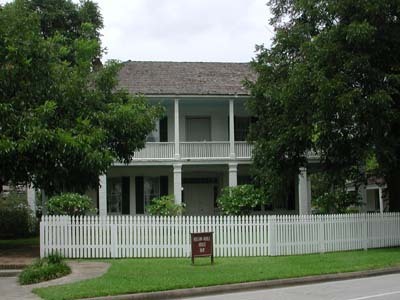 In 1959, the Heritage Society saved the house from demolition by moving it to Sam Houston Park and restoring it. The Nichols-Rice-Cherry House and the Kellum-Noble House have formed the nucleus of a collection of restored historic buildings moved to the park since then, all of which are available for tours by the Heritage Society. The stretch of Main Street between the Mecom Fountain at Montrose Boulevard and North MacGregor Way is one of Houston's most scenic drives. Old oaks arch over the street. The view in one direction is of Hermann Park, one of the city's most beloved, and most heavily used, parks. Located within its tree-filled acres are the Houston Zoo, Miller Outdoor Theater, the Houston Museum of Natural Science, the Houston Garden Center, the Japanese Garden, and one of the best golf courses in the South. The view across the street is of William Marsh Rice's bequest to the world, the beautiful campus of Rice University, Houston's answer to the Ivy League.